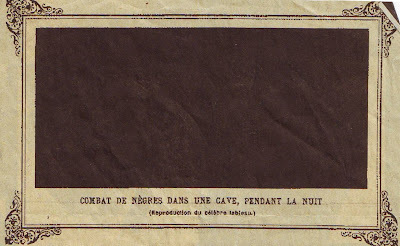 Negroes Fighting in a Tunnel at Night (1882, original French title: Combat de nègres dans un tunnel) is an all-black painting by poet Paul Bilhaud. It introduced the monochrome painting to art. The painting was appropriated in 1887 by the French humorist Alphonse Allais as Combat de nègres dans une cave pendant la nuit and published in Album primo-avrilesque (April fool-ish Album), a portfolio of monochrome pictures of various colors, with uniformly ornamental frames, each bearing a comical title. Combat de nègres dans un tunnel predates Malevich's, Black Square on a White Field by 31 years. Unless indicated otherwise, the text in this article is either based on Wikipedia article "Negroes Fighting in a Tunnel at Night" or another language Wikipedia page thereof used under the terms of the GNU Free Documentation License; or on original research by Jahsonic and friends. See Art and Popular Culture's copyright notice. This page was last modified 13:43, 1 October 2014.